Tet is the biggest and most important holiday to Vietnamese. 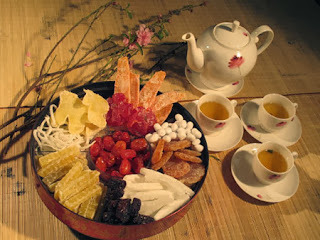 It is the chance for family union and enjoy the traditional dishes. 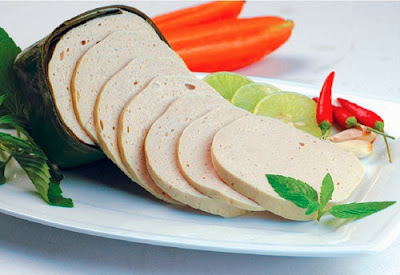 In this aticle, Vietwind Travel would like to introduce you some typical Vietnamese Tet dishes. 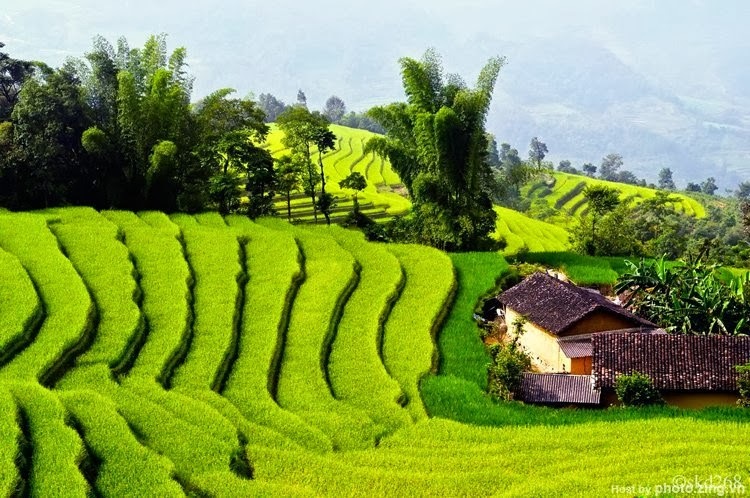 If you visit Vietnam on Tet holiday, don’t miss the chance to enjoy and make it for yourself to wholeheartedly experience the atmosphere of Vietnamese Tet. Banh Chung" (Chung cake) is a traditional and irreplaceable cake of Vietnamese people in the Tet Holidays.For the Vietnamese, making "Banh Chung" is the ideal way to express gratitude to their ancestors and homeland. In the ancient conception, the Earth is square, hence Chung cake's shape is square, too, to reflect the Earth shape. Besides, it emphasizes the important role of rice and nature in water rice civilization.. Main ingredients are sticky rice, pork meat, and green beans wrapped in a Dong leaves that will give the rice a green color after boiling. Making Chung cake is time-consuming and requires the contribution of several people. 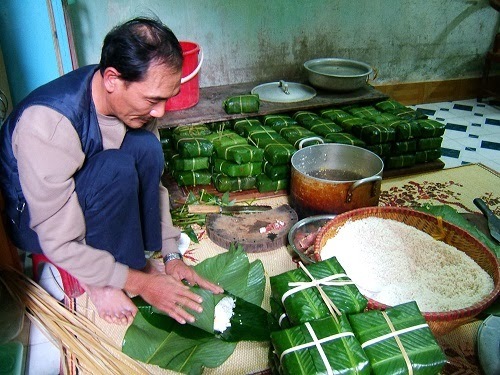 In making bánh chưng, all members of the family gather with different tasks, from washing the dong leaves, mixing the pork with spices, preparing the green beans and most important wrapping all ingredients in square form . Boiling the cakes takes about 6-8 hours. When sitting around the warm fire, all members in the family tell one another the past stories and are ready for a New Year with wishes of best things. 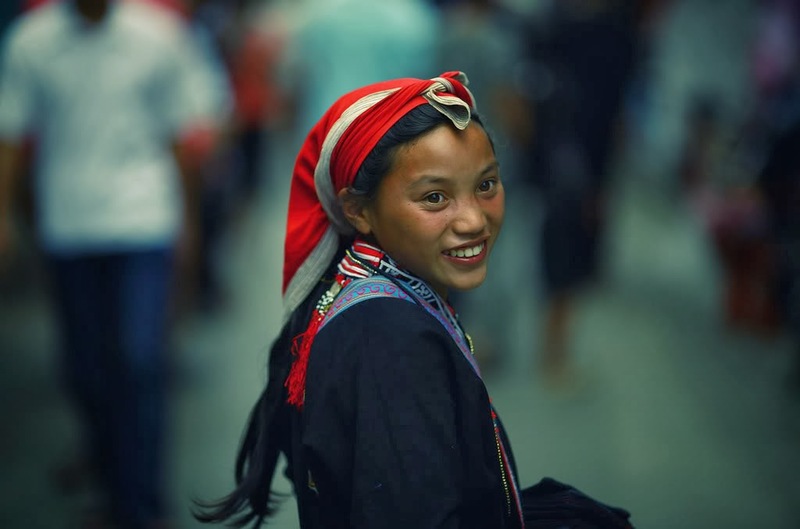 It is always the typical memory to each Vietnamese about Tet. Vietnamese sausage is made from very simple ingredients but in fact it requires lots of experience to select the finest ingredients. Picked onions is the dish sour, fresh and low-calorie to balance among the various dishes on Tet especially Tet in Northern Vietnam . And for many Vietnamese generations, pickled onions have been a cannot-be-missed dish during Tet holiday. 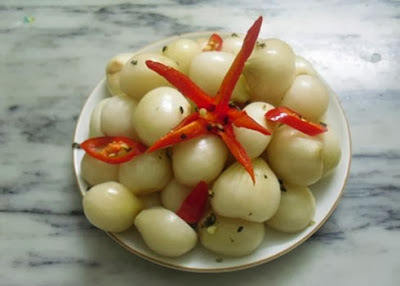 Vietnamese pickled onions also serve as a natural medicine for better digestion after high protein meals. The typical aromatic, crispy and sour taste of pickled onions going with fat jellied meat and tasty sticky rice cake awakens the Tet atmosphere in every family dinner. 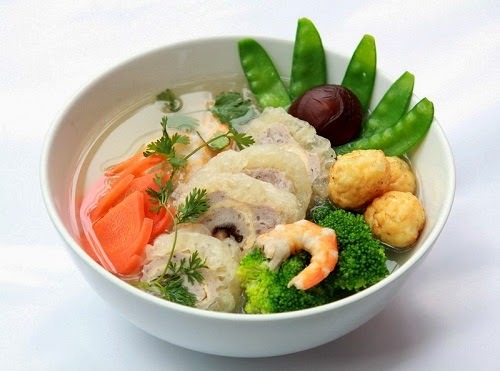 It is a kind of soup in Vietnam which is made from dehydrated fried pork skin soaked in a broth sweetened by dried mushrooms, prawns, and fresh vegetables. Since long time ago, Spring roll has been a familiar dish on the menu at all household during Tet. Its ingredients comprises mince pork, sea crabs, eggs, vermicelli noodles, mushroom, dried onions, pepper, salt, fish sauce. The mixture is then rolled in flat rice cakes and fried in a pan until crispy. Spring rolls are eaten hot with fish sauce is diluted slightly with a splash of lime juice, sugar, chilies and garlic. Papaya and a few fresh scented vegetables are added. It is an indispensable dish during the feast for Tet of people in northern Vietnam. 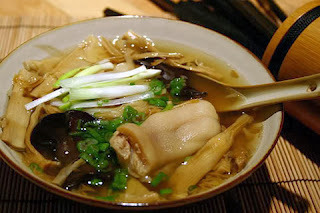 The dish shows the culinary cultural features of Vietnamese people who often make dishes from materials found in the forests and mountainous areas. Mut Tet (Tet jam) is not a food to serve in a meal during Tet holiday, but more like a snack to welcome guests in this special period. Mut is always kept in beautiful boxes and placed at the table in the living room, and it is the main food for the owners and guests to taste when they’re talking, enjoyed over a cup of tea.